Do you wish you had a dazzling smile but you have some issues with your teeth that you’d like corrected? Having a beautiful and healthy smile is essential in today’s world. At Hereford Dental Care near Parkton and Sparks MD, we care about you and your smile and want to provide you top notch restorative dentistry treatments, like a dental bridge, to give you the smile of your dreams. Restorative dentistry deals with any dental procedures that “restore” your mouth to its proper working order. So, for instance, if you have a missing tooth, restorative dentistry treatments would restore that tooth for you. No, we won’t help you grow a new one, but can offer several viable, successful treatments that can help you have a complete, fully functioning mouth and smile. Some restorative dentistry treatment options include: dental implants, a dental crown, a dental bridge and dentures. Dental Implants: Dental implants are a game changing restorative dentistry treatment that can restore a missing tooth or teeth as if you grew one yourself. They can secure a dental crown, dentures or a partial denture. Dental Crown: A dental crown, like a cover to your original tooth, can restore a tooth that has been damaged, decayed, cracked, is misshapen, discolored or otherwise causing your smile to not function properly. 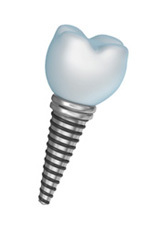 A dental crown is placed over your original tooth or over a dental implant and your smile will feel complete. The restorative dentistry crown looks, feels, and functions like a natural tooth. Dental Bridge: A dental bridge is used to “bridge” a gap in your smile by putting an appliance where the gap is. The restorative dentistry procedures using a dental bridge is secured between a dental crown on each side of the dental bridge. A dental bridge is very natural looking and can keep your teeth from misaligning or slipping. Dentures: If you have several missing teeth, dentures have long been a restorative dentistry procedure that has helped millions of people. At Hereford Dental Care, we offer a variety of dentures options. For a dental bridge or any other restorative dentistry, call Dr. Longenecker today, or visit us in Monkton. Our office also serves the Parkton and Sparks MD areas. We want to restore your smile so it looks its best!